This month we visit a famous open cluster with nebulosity, a number of lesser known open clusters, and finally a bright planetary nebula. Only one of these is a Messier object. If you wonder why these articles include only a handful of bright objects, it is because well known objects can be found easily in any number of printed astronomy guides or on the Internet. I also pick objects within a strict observing window each month, concentrating on a swath of sky two hours of Right Ascension wide from zenith east at astronomical dark. This month is from Right Ascension 03:28 to 05:28. In prior months I've mentioned several local observing sites, all within an hour drive of San Jose. This month I select objects that you may be able to observe from your backyard or at an SJAA in-town star party at Houge Park. Unless otherwise noted, the notes you'll read are from my daughter Mimi's observations (my note taking though) from our Los Gatos backyard in a 10" f/5.6 Dobsonian. All drawing are courtesy of local observer Peter Natscher (natscher@pacbell.net). Our first object is in Camelopardalis (Cam). 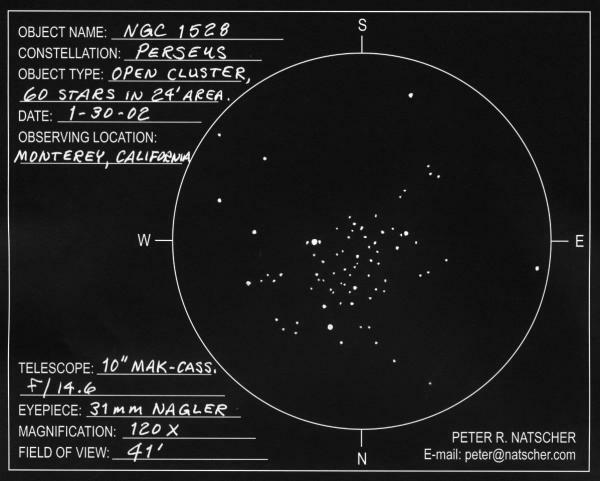 NGC1502 is an open cluster which punctuates a 2.5 degree long string of pearl asterism comprised of a dozen faint 8th and 9th magnitude stars. It's known as Kemble's Cascade. Begin in Perseus on Algol. Move 9 degrees north-northeast to Mirfak (Alpha Persei), then 10 degrees north into Cam to dim SAO 24054 (mag 4.2). Using an optical finder will make this easier. Continue 4 degrees north-northeast to an east-west chain of four stars all mags 4 and 5. Then imagine the chain continuing the same distance east-southeast. You will have found a small bright jewel. A tight pair of bright stars stand out in the middle of the group, with other pairs running mostly east to west on either side of the bright pair. The cluster was visible in my 11x70 finder. This one is worth a look. 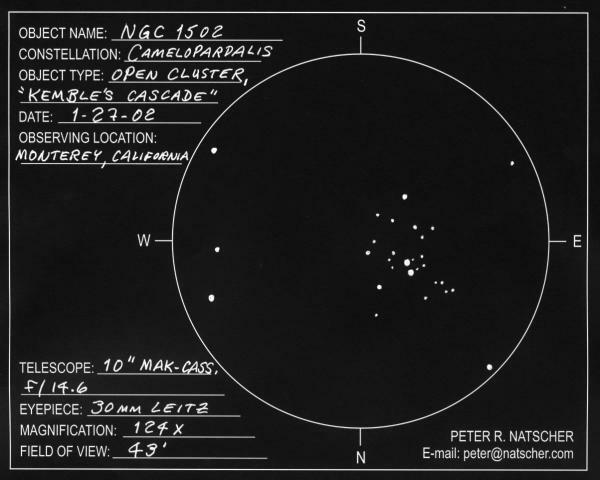 NGC 1528 is in a convenient location, and is easy to find in my 11x70 finder. It is an attractive open cluster with many bright stars. Two distinct chains extend west from the center of the group in a northeast to southwest direction, and a distinct condensation of stars sits southeast of the chains. Find it by following the curve of Perseus from Mirfak east, to where bright right triangle of mag 4 stars point west (these are the three eastern-most stars in the stick-figure of Perseus). Imagine a fourth star forming a parallelogram at the northeast corner, and you've found the spot. Just over a degree southeast you'll see NGC 1545, another open cluster in an easy location just east of a pair of mag 4 and 5 stars. It is a deceiving cluster. At first it seems there is nothing there but 4 bright stars. After looking a bit, many dim components begin to appear. The cluster is large. Bright Capella is east south-east from NGC 1545. The three stars close to the south of Capella are called "The Kids" and are the jumping off point to open cluster NGC 1664. Make another parallelogram using The Kids but place the imaginary star slightly more westerly. A bright star sits very close just SE of a chain extending south of a central concentration of stars defining the core of the cluster. Another chain emanates from the core sweeping to the east. All in all, this is a pretty cluster... a nice swirl of stars." Everyone knows the next one, the Seven Sisters, Subaru, The Pleiades — M45. Located in Taurus, this open cluster is obvious without optical aid. It is a wonderful target for binoculars, revealing dozens of young stars. Robert Leyland in Novato describes it in his 8" f/6 Dob: "Tonight they were very nice. The telescope brings out dozens of additional stars beyond the 6 I can see directly, (maybe 7 or 8 with averted vision). The 4 brightest stars simply glowed and a faint touch of nebulosity surrounded them." Move to NGC 1647 in Taurus using the V of the Hyades as a pointer. Come off the bottom (eastern) extension. The four stars are a great yardstick, taking that distance beyond Aldebaran and slightly west to mag 5.0 97-Tauri. A nice V of stars can be seen in a low power field, and the cluster sits just beyond the vertex of the V. A grouping of three double stars seem to define the central portion of the cluster, arcing gently east to west. The brightest star in the field was about 23' S of the center of the group. Six and one half degrees east south-east in Taurus is NGC 1817. It sits just off the tip of Orion's bow. Steve Sergeant used his Nexstar 5 at Houge to note "It is at the lower limit of stuff I expected to really see that night. With only perhaps 5 bright stars in my view, it was definitely an object for subtle tastes. One thing that made it interesting though, was observing it as a double cluster with neighboring NGC-1807." 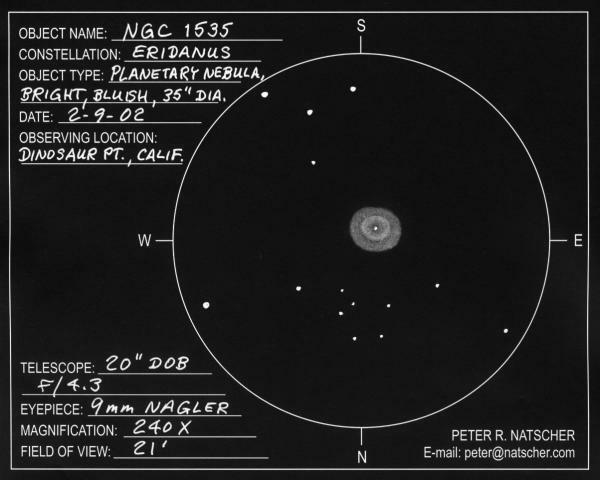 The last object is a bright planetary in Eridanus — NGC 1535. At 48"x42" this will appear about half the size of the Ring Nebula. I find it by starhopping from Rigel almost 20 degrees west to Zaurak (34-Eridani) which is the brightest star in the area at mag 3. Just about 4 degrees back toward Rigel, you'll find this planetary. William Schultz reports with his CG11 from Henry Coe "WOW! This P/N was bright enough to stop your eye at 80X, and it demanded more magnification. I clearly saw the two layers of nebulosity, the dark inner space and clear view of the central star."